With Stand Up Paddle Boarding being the fastest growing watersport in the world, more and more people discover the joys of being out on the water. But, let’s face it, choosing the right board can be a daunting task for beginning paddle boarders. 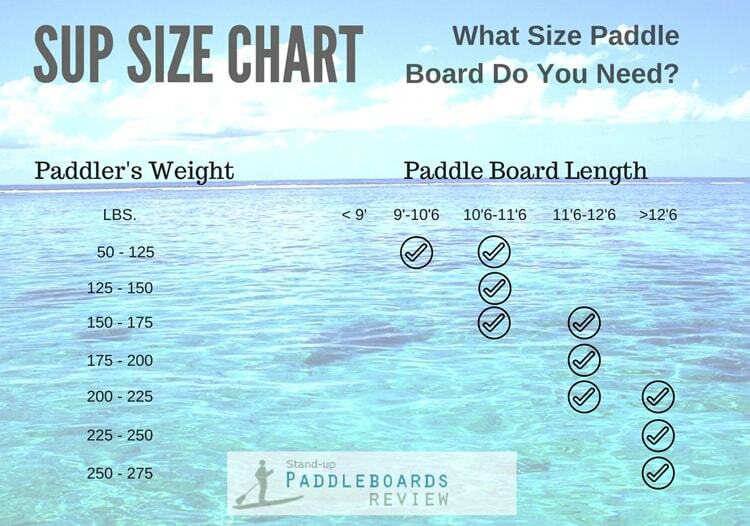 So, what’s the right size paddle board for you? The answer to this question depends upon your bodily weight, and to a lesser extend your height. But it also depends upon the kind of paddle boarding you intend to do, and your experience level. Use our SUP size calculator to get free advice about what length and width SUP board you need. Like we said, the right length of a paddle board depends on more factors than just your weight. It also depends upon the kind of paddle boarding you intend to do, and your experience level. Read on, for more details. Or check out our article about the 25 best inflatable paddle boards. The most important thing to consider in choosing a paddle board is that it can carry your weight! 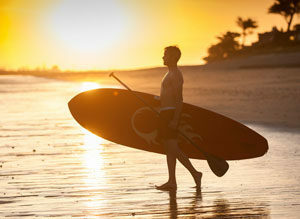 What Kind of Paddle Boarding Do You Intend To Do? For paddle boarding the surf zone you generally want a shorter paddle board with a narrower nose and tail section. Where for paddle board yoga or fitness stability is usually a primary concern, so you’d go for a wider paddle board (31” up to 33”). For touring longer distances, you’d want a paddle board that is longer and narrower, so that it has less drag and maintains its course better. If you’re a beginner, you are generally best of with an all-around paddle board. These boards usually are somewhere between 9’6” and 11’ in length, and approximately 30”or 32” wide. These boards also usually have a rounder nose and tail section. But there is something else you have to keep in mind. To help you with this, many paddle board manufacturers helpfully indicate the maximum weight capacity of their boards. Unfortunately, it’s our experience that – especially with some of the lower priced boards – some manufacturers are a little too optimistic in what weight there boards can carry. For instance, considering its low price the Bestway Hydro-Force is a decent paddle board. It has a recommended maximum weight capacity of 220 lbs. But based on user reviews, we wouldn’t recommend it for anyone over about 180 lbs. If a paddle board cannot carry your weight (or the combined weight of you and your spouse, kids, or dog), it will ride too low in the water, feel unstable and have more drag. In extreme cases it may even sink underneath you. So, in most cases the maximum weight capacity is a great indicator of whether or not a board is suitable for you. But do keep some margin. Some surplus capacity will generally give you a better user experience, and may also allow you to occasionally bring someone along with you and share the fun. But what if the manufacturer doesn’t give a maximum weight capacity? In these cases look at the indicated volume of the paddle board. With a simple formula you can calculate whether the SUP board is suitable for you. Now, not to worry, this is no rocket science. Simply multiply your body weight with the number in this chart, beside your experience level and/or type of SUP boarding you intent to do. For instance, if you are a beginning paddle boarder, who weighs 160 lbs, you should look for a paddle board with a volume between 160 and 224 liters ( 160 x 1.4 = 224 Liters). Does your length play an important role in choosing the right paddle board? It is true that taller people have a higher point of gravity than shorter people. So on the same board, a tall person may have a little more difficulty maintaining balance than a shorter person. However, taller people usually also weigh more than shorter people. So we recommend mainly focusing on the right paddle board for your weight, since that is a much more important factor. 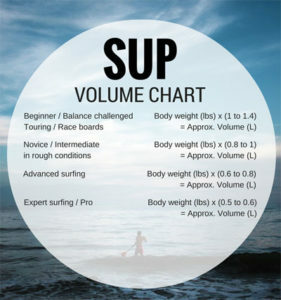 So, What SUP Board Is The Right Size For You? To summarize, always make sure that the paddle board you choose can carry your weight. Other than that, the length and width and overall shape of the board will depend upon the type of paddle boarding you want to do. SUP surfing: If you want to ride the waves in the surf zone, purchase a SUP surfing board. SUP surfing boards are usually shorter (max. 10′), narrower and have a pointier nose and tail than all around models. All around SUP: All around paddle boards are great in all kinds of conditions. They usually are between 10′ and 12′ in length and 29” to 32” in width. All around SUP boards usually are a good choice for beginning paddle boarders. Touring SUPs: Touring boards are longer and often narrower than all-around boards (usually they come in 12’6” or even 14′ in length). They have a pointy nose, are often designed as a displacement hull. This means they ‘split’ the water, instead of ‘planing’ on it. Touring boards have less drag than all around boards and are better at maintaining course. This makes touring boards great for flatwater paddling, especially over longer distances. Yoga and fitness SUP: Many people like to combine their yoga or fitness routines with paddle boarding. Balancing on your board, you’re also training your muscles and core strength. Yoga and fitness boards are usually wide (32″ to 36″) for more stability and balance. For more good information look at this video from Rei, or look at our top 25 inflatable paddle board reviews.